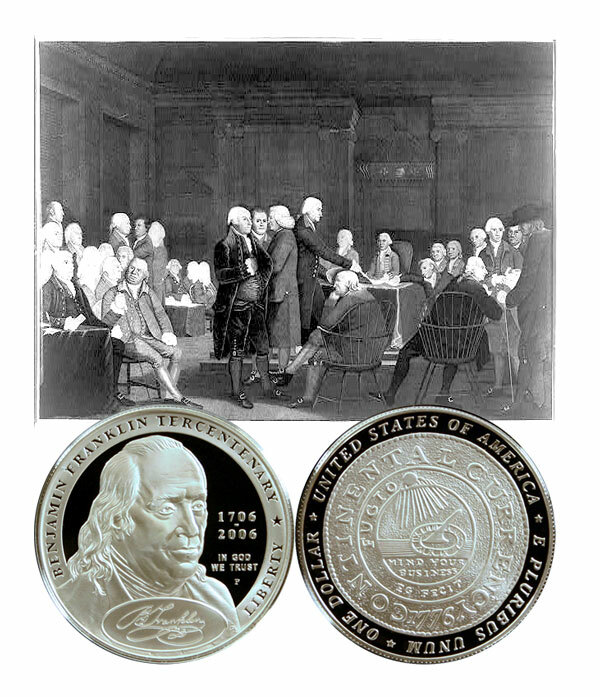 Today, the Benjamin Franklin Founding Father Commemorative Silver Dollar Coin remembers the gentleman’s return to Philadelphia on May 5, 1775 and his subsequent involvement in helping found a new country. One of the last pieces of business he was engaged in was one in which he was secretly “approached” by persons connected with Lord Howe and Lord North. In the course of this the formal attempt was made to bribe Franklin but without success. In fact, these attempts had been very numerous. The political morals of England were then so low, and statesmen were so accustomed to bribing and being bribed that they could not conceive of any one rejecting such offers as were made to Franklin. He still suffered from the venomous slanders of Arthur Lee. He, however, placed his agencies in Lee’s hands and spent one last day with his tried friend, Dr. Priestley, who never deserted him. Franklin experienced profound feeling in leaving England. It meant the impossibility to peaceably settle the troubles between England and her colonies. To avoid arrest, he went to Portsmouth as secretly as possible and arrived in Philadelphia May 5, 1775. In the meantime his faithful wife, with whom he had lived so long, had passed away. Americans of the present day scarcely ever appreciate the fact that Franklin performed his greatest services for his country when he was an old man; when he had passed beyond the age to which very few attain, an age when those that reach it are beginning to be feeble in body and torpid in mind. When Franklin returned from England he was sixty-nine years old; older than Washington when he died. When he landed, the battles of Lexington and Concord had already been fought. The colonies needed the services of every man, but especially of a man whose character and abilities were so transcendent. Therefore instead of coming home to spend his old age in peace and quiet, Franklin was called upon to perform services that were so harassing and difficult that they would have taxed the energies of a far younger man. The breach between the colonies and the mother country, of course, brought a breach between him and his English friends. This breach between old friends was, however, healed in after years and they became enemies no longer. In quite a different strain he wrote to Dr. Priestley, for whom he had a deep affection, but his letters show profound feeling against England. He had hardly landed in May before he was elected delegate to the Second Continental Congress. He was especially active on committees and was instrumental in organizing the army, navy and the finances of the new government. He was especially instrumental in outlining the national policy of the government. His calm temperament and sound judgment made him just the person to harmonize conflicting interests. He equalized and unified action. He restrained the overzealous, and spurred on the slow footed. To the contention that America was unfillial in her rebellion, he retorted that Britain had never accorded any advantage to Saxony, her mother country, but had subsidized the King of Prussia to invade that mother country. In all this he had to have his joke, and Parton in his “Life of Franklin” conjectures that the reason why he was not called upon to write the Declaration of Independence was that he would have put a joke in it. It is of interest to notice that it provided for the admission to the confederation, on application, of Ireland, West Indies Islands, Canada, and Florida. Not only did he have to serve in Congress, but he was put in charge of the postal service, and made chairman of the provincial committee of safety to organize Pennsylvania for war. He tells Dr. Priestley in a letter that he began his daily work at six o’clock in the morning by attendance upon this committee. He also “devised and constructed” marine Chevaux de frise to protect the Delaware river. In October, 1775, he was elected a member of the Assembly of Pennsylvania, but as the oath of allegiance, to the King was still required he refused to take it and resigned his place. In September, as one of a committee for Congress, he had gone to Boston to confer with Washington and to view the condition of the war. It took thirteen days to go on horseback from Philadelphia to Boston. There he, of course, met the great leaders of the Revolution who looked upon him with the greatest admiration. As if all these services were not enough to put upon an old man of seventy years, Congress was selfish enough to send him to Canada to confer with Arnold about the attitude of Canada. It was early in the year and the ice still made progress in the lakes and rivers impossible. Upon reaching Saratoga he realized the task he had undertaken and sat down to say a last word to his friends whom he never expected to see again. He lived to reach Canada, but the state of his health compelled a quick return without accomplishing anything. Upon recommendation of Congress, the different states set about erecting new, independent governments, and of course Franklin was called upon for assistance and advice in regard to Pennsylvania’s constitution. He was elected a member of the constitutional convention and presided over its meetings. The new constitution called for a legislature of one house, Pennsylvania being one of only two states having but one house. Franklin seems to have always opposed bi-cameral legislatures. Even in the spring of 1776, many leaders were opposed to permanent independence, but Franklin could see no probability of a return to the old order of things, and when Samuel Adams threatened to form a New England confederacy, Franklin offered to join it. But he did not need to join a New England confederacy to declare his independence of England, for it was only a short time until he was on a committee appointed by Congress to draft a Declaration of Independence. The Benjamin Franklin Founding Father Commemorative Silver Dollar Coin shows with an artist’s image, circa 1800s, of Congress voting on the Declaration of Independence.